The ML10 is a 10 head filling machine designed to fill and seam standard aluminium cans. It is specifically designed for the micro-brewery environment where space can be governing factor. The unit can be static only and not suitable for mobile. The ML10 can line has a footprint of 4000mm x 700mm. The throughput of cans is between 3,000 and 4,000 cans per hour, dependant on can size and on the equipment in the brewery and temperature. Throughput can be increased via speed control valves once the customer is competent with the operation. These speeds are based on the correct presentation of product. 2 x conveyors built in, accumulation at start and end. 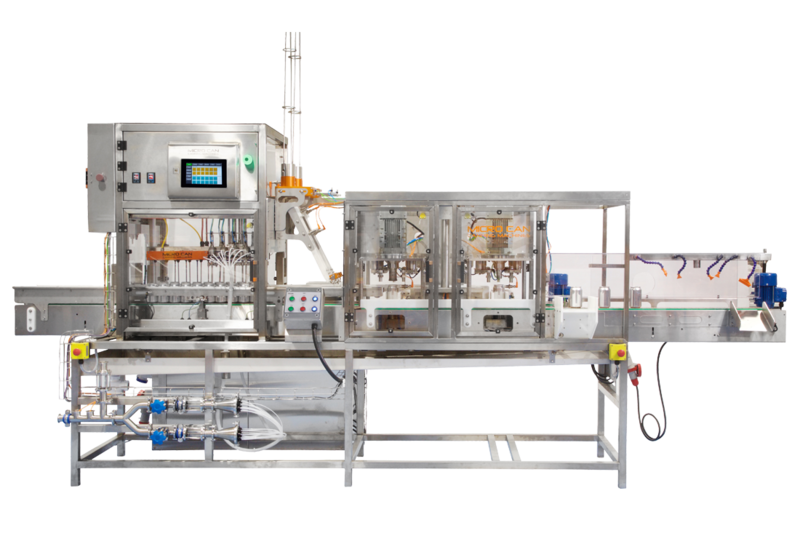 2 x 5 independent filler gantries each with 5 C02 purge and 5 x 316 stainless steel valves. fill valves. Digital C02 display that alarms under loss of gas. Digital compressed air alarm that will alarm of loss of air pressure. Single lid slide with lid cassette sensor. (per lane) 2 x l lid cassettes supplied. 2 x full machined 316 stainless can seamers fitted with CMD tooling for guaranteed seams. Lid in place sensor per seamer. Flow control valves for balance of fill per each lane. Digital temperature sensor for monitoring product input. Digital pressure sensor on product input to control tank top pressure.